LCD monitor ideal for displaying high resolution graphics and dedicated software. Control keypad with reduced number of keys for simple and rapid machine use. 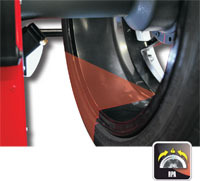 The new wheel guard allows use whit wheel sizes up to 44”. 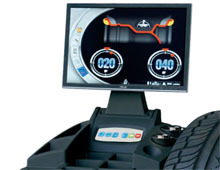 Electronic input of wheel diameter and distance with FSP function which automatically activates the balancing programmes, avoiding keypad selection . Three modes to position the adhesive weights: with the weight holfer clip, with the 6 o’clock laser indicator or manually at 12 o’clock. Automatic wheel positioning in the point where the balancing weight has to be applied and electrical positioning brake (RPA). 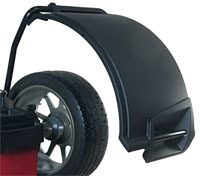 LED spotlight to light-up the work area and make it easier to clean the rim, check the wheel and apply weights. The adhesive weights can be positioned extremely rapidly using the laser pointer at 6 o’clock (optional). Quickly and intuitive sensitivity calibration. 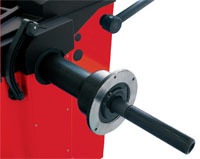 The ne sample weight supplied with the machine is simply applied directly to the spin unit, ensuring maximum precision and eliminating operator error. Rim Width Setting Range 1.5” - 20"
Rim Diameter Setting Range 1” - 35"
Rim Diameter Measurement Range 10” - 28"
Corghi USA expressly warrants its products will be free from defects in material and/or workmanship for the time period specified. Corghi USA must be informed in writing within 7 days after discovery of a defect. Corghi USA reserves the right to repair or replace a product at our discretion. Consumable products and accessories such as but not limited to; plastic protection parts, bead breaker pads, inflation hoses, and rollers, are not covered under this warranty. Corghi USA agreement to repair a tire changer or balancer is expressly in lieu of all other warranties, express, implies or statutory, including any warranties for merchantability and fitness for a particular purpose. Corghi USA maximum liability shall be limited to the cost of the machine. In no event shall Corghi USA be responsible for owner’s lost profits, goodwill or other incidental or consequential damages. Corghi USA is not responsible for equipment or accessories damages in shipment. Freight claims are to be made directly with the carrier. We will be more than happy to assist you with any questions regarding filing claims. LCD Monitor - LCD monitor ideal for displaying high resolution graphics and dedicated software. Weight Management - As standard, the Weight Management programme suite which included Lessweight. This software allows a significant reduction of balancing weights, through the analysis of different threshold values, according to the vehicle type: fast or slow (unique on the market). Hidden Weight - Keeps rims looking great by dividing the external side balancing adhesive weight into two equivalent weights applied in hidden locations behind the spokes. OPT Flash - Minimizes road noise by allowing the operator to alter the position of the tire on the rim in order to optimise quietness. AWC (Auto Width Calculation) - Automatic calculation of the width (AWC function) even if the AWD* (*optional accessory) external sensor is not present. 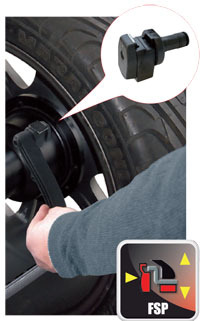 The wheel balancer calculates the width by reducing the operational time (*).